Its front glass exterior makes this corner shebang look as if it were the Asian version of a huge fluorescent glow-worm. 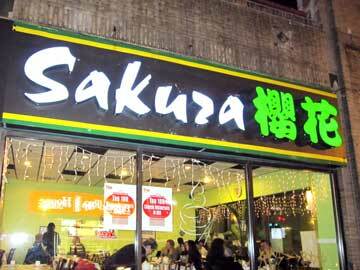 Frankly, in the evening, the well-lighted interior is a luminescent reverie of a seeming pan-Asian luncheonette. 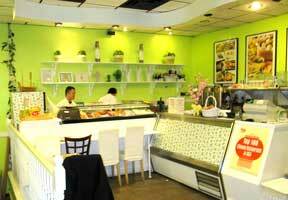 As you enter, a three-chair sushi-tushie-bar deli-counter is to your left, up a level; and to your right is a “banquet hall” proliferating with tables covered by white linen cloths beneath clear plastic protectors. Three long tables are set to seat eight patrons upon lattice-backed wooden chairs; six smaller tables seat four, one for three and one for two. Everywhere are miniature white teapots ready to be poured. In one corner, a palm’s fronds stick out and upward toward a high dropped-ceiling. Open brown cardboard boxes with Chinese lettering adorn other corners of the eatery. This used to be the location of Nice Chinese Noodle House which had served tons of scalding wontons accompanied by dozens of white-lipped ladles. A plethora of sliced hot cherry peppers and sordidly scorching sauces flavored the soups, requiring the omnipresence of hundreds of thin napkins. The napkin-tissues were a necessity, to wipe your brow, nose, mouth, hands, chin, clothing and finally your eyes, in heated, tearing disbelief. Sakura’s fare is mellow in contrast, flavored in Mandarin fashion, with choices of items infused with alleged Shanghai and Japanese specialties. Nevertheless, when in Chinatown, do as the Chinese do: Mandarin’s a must. In fact, the first few times you come here for lunch, dinner or take-out, simply listen to and watch what the Chinese customers are ordering. Over sixty percent of the diners are speaking various Oriental dialects, all seemingly understandable to the pleasant and attentive wait-staff. English may not be as easy on the servers’ tongues, but the pictorial displays on the menu allow pronounced pointing to become good manners. If you spend more than $40 per family-of-five at this BYO, my guess is that your stomachs will be up the Yangtzee without paddles, gorged. This is the perfect place to Shanghai your entourage, especially young children, to introduce them to the sounds and the visual feel of authentic Chinese noodle notions. 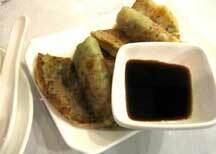 You may desire to begin your meal with “Scallion Pancakes” to initiate the youngsters to a definitive cultural lesson. Two flattened and folded golden thin pancakes appear on white concave plates upon which rest separate cylinders of dark sauces. American pancakes, of course, are round and fluffy, ready for buttering and sweet jelly toppings or syrup. The Chinese version, on the other hand, is limply lengthy and soggy, studded with bits of scallions waiting to be dipped into a soy-ginger or hoisin broth. "Eat with sauce," demands our plain-clothed waiter kindly; "No good without sauce." The faces children make can be scary at times, especially when confronted with tart-flavored green onion sponginess between their cheeks, so be certain to have an order of mini-dumplings nearby to return the twinkles to their eyes. 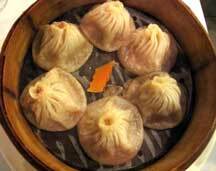 A dozen dumplings are displayed in an oblong deep dish. 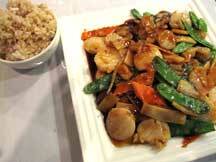 They are large pinched flat noodles completely embracing, if not choking, chopped shrimp and pork mounds. All seem to squirm in fragrant peanut oils. The kids soak their tongues around the slippery wrappings and let their mouths churn upon the interiors while dipping chopsticks to garner more. Now, allow young eyeballs to gaze toward something steamed in bamboo. “Juicy Buns” are contoured purses whose square sheet of thick wrapping is twisted into spirals of protruding “outty” belly-buttons. Six rest comfortably upon a wilted green lettuce leaf. 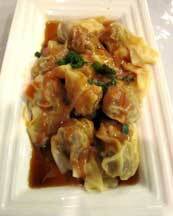 Liplike in texture, the perimeters are filled with a choice of shrimp or pork or crabmeat. Juices drip wantonly. The sensation one feels is that of a messy kiss. Young teens will beg for another round. "Don't forget sauce," says our waitress. 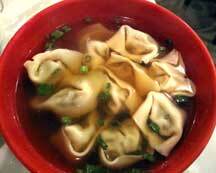 Soup is provided in a fiesta-red bowl with enough wontons for four adults. The “Shanghai Wonton Soup” special is a richly cooked clear broth whose chickens’ bodies and bones had to have been simmering in it overnight. This concoction is the closest one can achieve in Chinatown today to the original versions served at “South China” or “919,” restaurants that had been built and flourished in early 1950’s Philadelphia when there’d been a “Chinese Wall.” The skins are silken and seem to be smiling, embedding meaty balls textured by bits of ginger and sprinklings of cabbage and green scallion rounds. 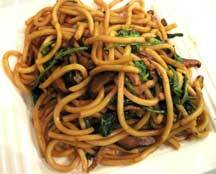 Thickest “spaghetti” noodles culminate in an Udon blend, piled high on a square platter with greens and mushrooms intermingled in a sweet sesame slurping gravy. Chopsticks are used in a shoveling fashion, with mouths no further than two inches from the plate. Eventually, gobbling chins graze the noodles, attempting to whistle them in by inhaling whatever is prodded upward by the “utensils.” Children at the table begin laughing when looking at each other, a feat made extremely messy when parents are likewise overcome by giddiness. Small eating plates’ splattering overflow requires the need for the aforementioned plastic tablecloth-coverlet protection. Allow me to name some of the more exotic selections to frighten fanciful young men and women: “Wine Soaked Duck Tongues,” “Lion’s Head,” and “Tripe Salad.” I’d stick at first to the basics, with more common adventurous family fare like slivered scallops, snow peas, bean sprouts, engraved-cut carrots and fresh bamboo shoots. “Sakura” means “cherry-blossom.” It’s fun to watch kids blossom beside you in Chinatown.